If you think of Volvo as autodom’s safe but slightly stodgy Swede, think again; the company’s new XC40 compact crossover just might be enough to alter your perception. Due in dealers for demo drives next month – with deliveries starting in the spring – the XC40 arrives as a 2019 model to compete in what has lately been the fastest-growing segment of the passenger-vehicle market. It slots in as the smallest of Volvo’s three crossovers, with its 174.2-inch overall length being about 10 inches shorter than that of the XC60 (just redesigned for 2018) and 20 inches shorter than the top-line XC90’s (redone for 2016). Note that Volvo also offers wagons and “raised wagons” that are available with all-wheel drive (sort of “crossover light” models) in V60/V60 Cross Country and V90/V90 Cross Country form, with a redesigned V60 wagon due out this summer. Thus Volvo’s current lineup – which includes only two sedans – is rather “cargo-centric” … hardly a bad thing to be. A strong family resemblance. Volvo’s crossover lineup now includes the “larger compact” XC60 (left), midsize XC90 (center), and new “smaller compact” XC40 (right). Initially, the XC40 will come in all-wheel-drive T5 form with a 248-horsepower 2.0-liter turbocharged 4-cylinder engine and 8-speed automatic transmission; due this summer is a less-expensive front-drive T4 with a 187-horsepower version of that engine. 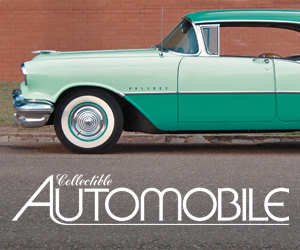 Both will be offered in base Momentum, upscale Inscription, and sporty R-Design trim levels. The XC40 T5 boasts an unusually long list of standard equipment considering its $36,195 (including $995 destination) base price. Along with the expected class features are many that typically cost extra, such as leather upholstery, power liftgate, 8-way power driver seat with memory and 4-way power lumbar adjustment, Apple CarPlay/Android Auto, satellite radio, WiFi hotspot, remote start through a mobile app, and road-sign information. Also standard are a number of high-tech safety features, including forward collision warning and mitigation with pedestrian/cyclist/large-animal detection, lane-departure warning and mitigation, lane-keep assist with oncoming-traffic avoidance, rear-obstacle detection, and the Volvo On Call smartphone connectivity system. All are also standard on the upcoming front-drive T4 version, which costs $2000 less. Styling elements that distinguish the XC40 from its larger siblings include triangulated rear roof pillars (other models’ are straight) and available white or black roof treatment. Even the base Momentum can be equipped with a full complement of features – some in packages, others individually – many of which are standard on the Inscription and R-Design. The list includes a panoramic moonroof, heated front seats and steering wheel, 8-way power front passenger seat with 4-way power lumbar adjustment, extendable driver- and passenger-seat thigh support, keyless access and starting with hands-free activation of the power liftgate, two-zone automatic climate control, heated wipers, HomeLink garage-door opener and compass, a folding cargo floor, power-folding rear seat backs and headrests, wireless device charging, a pull-out storage drawer beneath the driver seat, auto-dimming inside and outside mirrors, 360-degree camera, headlight washers, adaptive headlights with cornering lamps, a navigation system, and a high-end Harman Kardon audio system. Also on offer are blind-spot and rear-cross-traffic alert along with front-obstacle detection (joining standard rear-obstacle detection), Volvo’s Four C adjustable suspension, optional metallic paint, and a white-painted roof. Of note is the available Pilot Assist, a semi-autonomous system (you still have to have your hands on the steering wheel) that can control acceleration, steering, and braking on the highway at speeds up to 80 mph, including in stop-and-go traffic. Even equipped with all these features, a Momentum tops out at under $44,000, making both its base and “loaded” prices much lower than those of most comparably equipped competitors. The base Momentum and upscale Inscription are offered with two-tone interiors with upholstery in white (left) tan, or red, while the sporty R-Design’s black interior can be highlighted with orange carpet and door treatments (right). But what’s perhaps most surprising about the XC40 is how “colorful” it can be. Some unusual and vibrant exterior hues can be topped with a white roof (black on the R-Design), and interiors can be trimmed with white, tan, or red upholstery, while the R-Design’s all-black surfaces can be accented with bright orange carpet and door trim. For a compact crossover, the XC40 is quite spacious inside. There’s good headroom and legroom up front, and as a bonus to shorter folks, the driver seat can be raised quite high. It also comes standard with 8-way power adjustment (including a tilt cushion) and 4-way power lumbar support, and can be optionally heated and fitted with an extendable thigh support. In back, there’s ample headroom even with the available panoramic sunroof, and legroom should be sufficient for adults as long as the front seat isn’t moved all the way back (in which case my 5’9 frame just barely fit). Rear-seaters also get their own climate vents and a USB port, there are cupholders in the fold-down center armrest, and the center tunnel is low, aiding foot space for a middle-seater (who’d have to be fairly small to fit width-wise). That triangulated rear roof pillar doesn’t do much for rear-corner visibility, but the standard 180-degree rearview camera (360-degree ones are optional) and available fold-down rear headrests help when backing. Visibility is great to the front corners, but it goes downhill from there. The side and rear pillars are quite thick, though the 180-degree camera (and available 360-degree cameras) and folding rear headrests help a lot when backing. The sunvisor doesn’t extend when swung to the side, leaving about two inches of the window uncovered. Nice materials in available two-tones match with stylish trim to create an upscale environment. 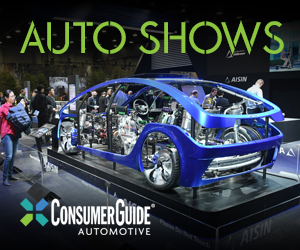 There are also plenty of storage cubbies, including a modest-size glovebox, a large console box with removable trash bin, two cupholders, a large forward bin under 12-volt and two USB plugs, and huge map pockets in the doors. There are also bag hooks that can be folded out of the glovebox door, and a small, optional drawer that slides out from beneath the driver seat. The XC40 features a 12.3-inch digital instrument panel and carries Volvo’s now-traditional 9-inch vertically oriented center touchscreen, which absorbs nearly all infotainment and climate functions. 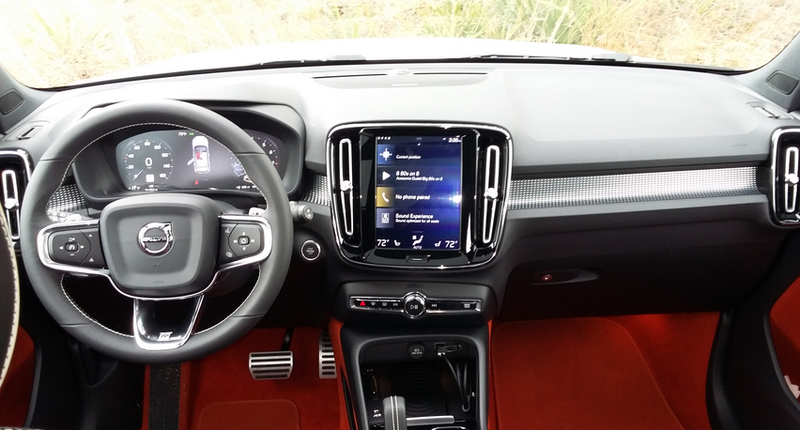 As with all the latest Volvos, the XC40 carries a vertically oriented 9-inch center touchscreen that absorbs almost all infotainment, climate, phone, and vehicle-settings functions. The main screen is divided into four “tiles” of different primary functions that expand when you press on the tile, with additional screens accessed by swiping right, left, or down on the touchscreen. While this makes it much like a smartphone, it often takes multiple steps to get to the desired function, whereas some vehicles allow you to get there with the simple press of a single button. While Volvo’s isn’t our favorite system, it gets easier to navigate with practice, though we’d recommend that “practice” take place while the vehicle is stationary – and preferably right after you buy it. One other interior oddity: The shifter is the “toggle-type,” which means you shove it forward for Reverse, pull it back for Drive, and push a console-mounted button for Park. Yes, you’ll get used to it, but it may complicate things if you have another car that shifts in a more conventional manner. Cargo flexibility is an XC40 strong point. While the rated 47.2 cu. ft. behind the front seats is about 16 cu. ft. smaller than that of Volvo’s larger XC60, it’s on par with other smaller-size entries in the compact class, and you can store the cargo cover beneath the floor – a nice touch. It also has a floor that can be set at different heights, the higher of which leaves it level with the flat-folding rear seat backs with a huge flat space beneath it for additional storage. Also available is a floor with a folding section that partitions off the rear for keeping items from rolling forward, a 12-volt outlet, fold-out bag hooks, and tie-down loops, and the standard power liftgate can be optioned with a hands-free feature. Available are power-folding rear seat backs; press a button in the cargo compartment (left), and one or the other seat back will flip forward. Doing so creates a long, flat load floor if the floor panel is in its raised position (which provides for more storage under the floor). Also available is a folding cargo floor that can prevent items at the rear from rolling forward, and the one-piece hard cargo cover can be removed, flipped over, and stored underneath the floor. Furthermore, a power liftgate is standard, a hands-free one optional. Although the T5’s standard 248-horsepower engine is quite strong for the class, its response isn’t always quick or linear. In normal driving, it’s fine, though stabbing the throttle while underway usually results in a delay before the transmission downshifts and power arrives, and that power can arrive in greater quantity than you expected. Floor the throttle from a stop, and it’s much the same: The XC40 moves out, but doesn’t really deliver strong acceleration until you’ve covered the first 20 feet or so. Volvo says the T5 can run do the 0-60 sprint in about 6.2 seconds, quick for the class, at least with standard engines. Our drive around Austin, Texas, didn’t provide us with the kind of pockmarked pavement we “enjoy” around our Chicagoland offices, so a ride evaluation will have to await a local test. But what bumps we hit seemed to be absorbed quite well, and handling was plenty competent. Nice little touches on the XC40 include some techy interior trim and brand logos in the front side turn-signal lenses. 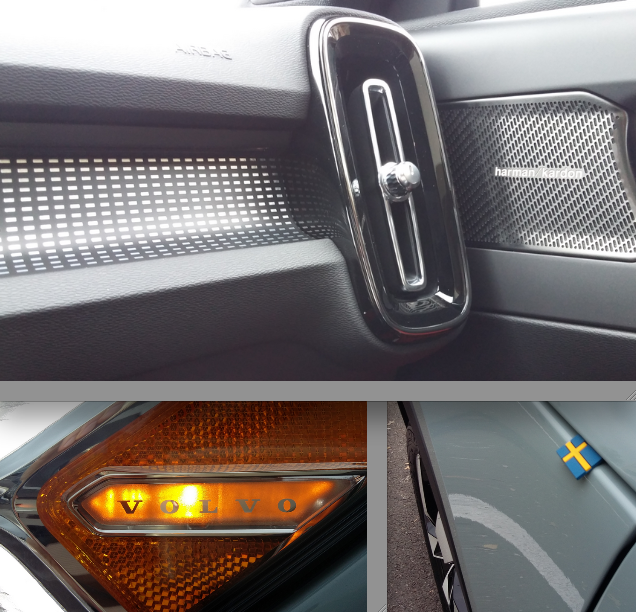 But Volvo says only the first 1000 or so examples will get a tiny Swedish flag emblem sticking out from under the hood. One more thing. 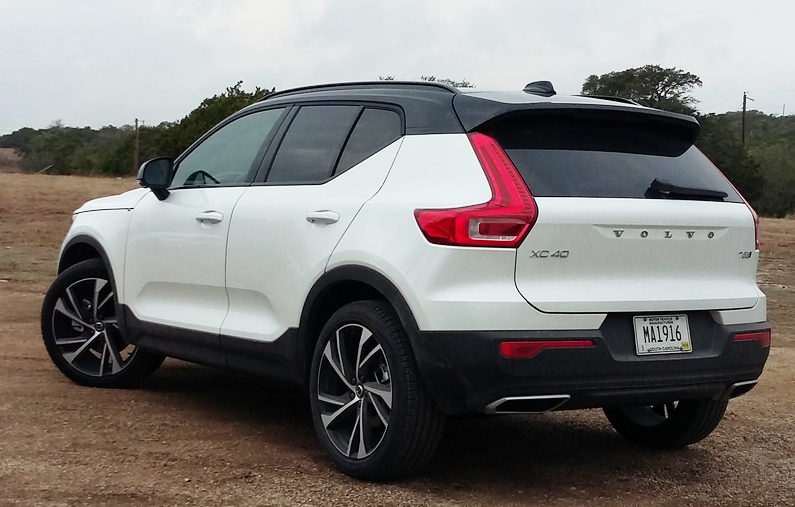 Volvo is introducing a new “subscription” program with the XC40 called Care by Volvo. For a flat monthly fee – and no money down with approved credit – you get all maintenance and insurance (if you qualify) for a 24-month period, with the option of switching to another vehicle after 12 months … so essentially, all you have to pay for is gas. The two vehicles currently offered under this program (which can be applied for online) are a T5 Momentum with Premium and Vision packages along with heated front seats and steering wheel for $600 a month, or a T5 R-Design with Premium, Vision, and Advanced packages along with heated front seats and steering wheel, a panoramic sunroof, Harman Kardon audio system, and 20-inch wheels for $700 a month. Volvo says it expects to add more available vehicles to the program in the future. What it all amounts to is that Volvo enters a very competitive class with a very compelling vehicle. 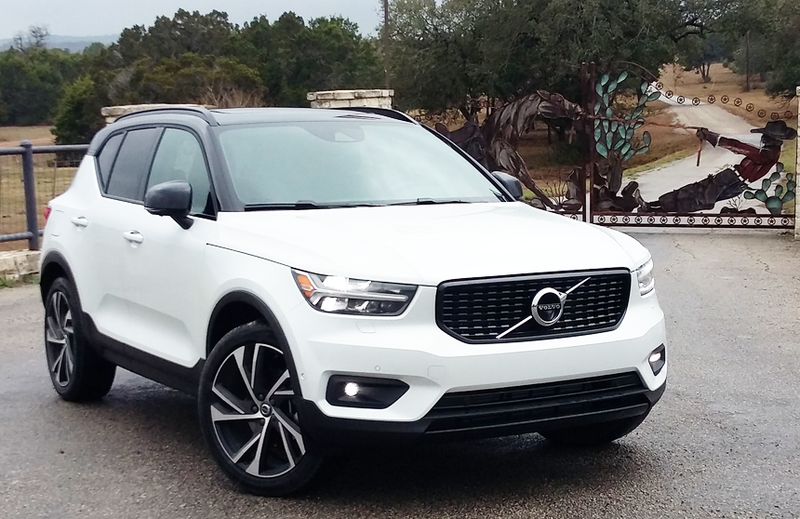 While the XC40’s greatest strengths are cargo flexibility, available safety features, and a terrific value equation, it’s also sporty and stylish enough to make those who never considered a Volvo to sit up and take notice. It’s not your father’s Volvo. But the XC40 combines a sporty appearance, stylish interiors, lots of high-tech features, and terrific cargo flexibility with the company’s traditional safety focus to create a fully modern and very attractive entry in the premium-compact crossover segment. Written by: Rick Cotta on February 26, 2018.on March 22, 2019.